When you set foot on Air Tahiti Nui’s (TN) planes, you immediately get a sense of relaxation and the island life before ever touching the island's warm sand and cool waves. 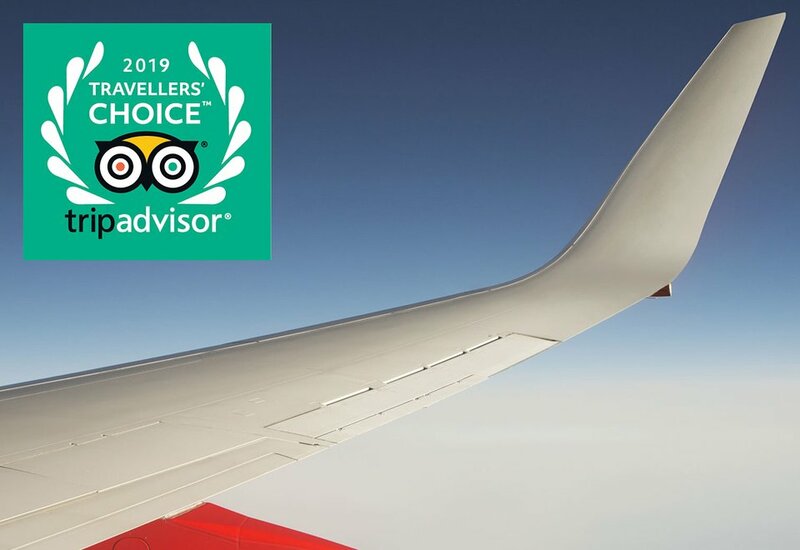 As ambassadors of Tahiti, Air Tahiti Nui’s staff embodies the beauty, elegance and hospitality their country is famous for through their professionalism, inflight service and myriad small details. Air Tahiti Nui began operations on Nov. 20, 1998 and quickly added service to Tahiti from Los Angeles, Paris, Tokyo and Auckland. Wanting to share the magic of the tiny island with the world, Air Tahiti Nui quickly extended its route network to include 39 major cities around the globe, thanks to partnerships and codeshare agreements with American Airlines and Qantas. Headquartered at the Fa'a'a International Airport in Papeete, Air Tahiti Nui’s fleet consists of five Airbus A340-300s, which are being phased out by September 2019 and being replaced by Boeing’s 787 Dreamliner. Passengers, no matter what class they are flying in, will feel like they are already in Tahiti as soon as they board. If you listen carefully, you can hear the sounds of a ukulele and smell the fragrance of the tiare flower as you make your way to your seat. "In Tahiti, the word Maeva means welcome, a concept that inspires these details on Air Tahiti Nui's planes." Air Tahiti Nui’s aircraft are painted white with calming shades of blue, paying homage to the sky, lagoons and the South Pacific. 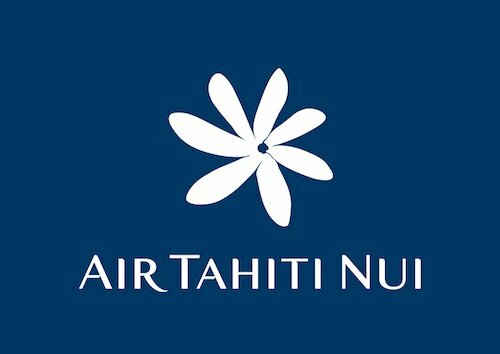 The white tiare flower has been featured prominently on the tail fins of all Air Tahiti Nui aircraft since 1998. Air Tahiti Nui’s livery isn’t the only feature that captures the spirit of Tahiti. Even though Poerava Business, Moana Premium and Moana Economy provide different levels of comfort, they all immerse the traveler in Tahitian hospitality. On their Boeing Dreamliner 787, Poerava Business Class seats are 180-degree full-flat seats designed by Rockwell Collins. To provide an open feel, a variety of storage areas, including shelves, pockets and cabinets suitable for laptops are easily tucked away and do not intrude on the seat. The cabin features a total of 30 seats configured in five rows in a six-abreast (2-2-2) arrangement. Air Tahiti Nui also provides an onboard amenity kit as well as headphone for Poerava Business Class passengers. The amenity kit includes a soft, comfortable polar blanket to stay warm, a regular-sized pillow and a kit of accessories including lotion, toothpaste/toothbrush, mouth wash and lip balm to keep you relaxed and fresh. 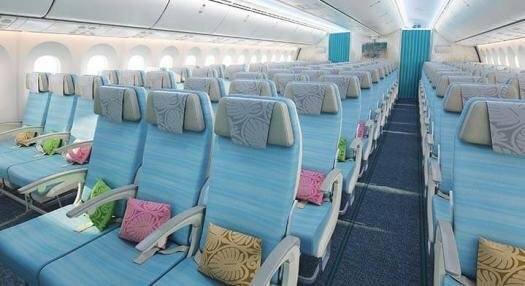 Boeing’s 787 Dreamliner introduces Air Tahiti Nui’s first premium economy product, Moana Premium. Recliner style Z535 Premium Economy class seats are provided by ZODIAC Aerospace and feature seafoam blue upholstery, matching the seats in Poerava Business. Continuing with the theme of relaxation, the cabin offers extra leg room than Economy, which leads to a more comfortable flying experience. Moana Premium seats are 20.4 inches wide and are installed at a pitch of 38 inches with a recline of 8 inches. The Moana Premium features a total of 32 seats configured in five rows on a seven-abreast (2-3-2) arrangement. Passengers in Moana Premium also receive an onboard amenity kit. 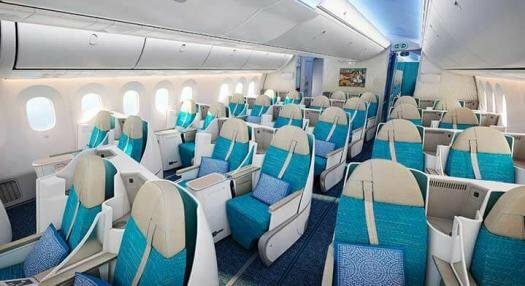 When you enter Moana Economy, you are greeted with a color palette that takes inspiration from the rest of the plane, with seafoam blues and creams. Moana Economy is made up of 264 seats that recline to a comfortable 118 degrees and a pitch of 32 inches. During your flight on the 787 Dreamliner, you can enjoy the most up-to-date collection of TV shows and movies on Air Tahiti Nui’s entertainment system. Poerava Business Class seats are equipped with 16-inch touchscreens at each seat as well as two USB power ports and one international power outlet. Moana Premium is equipped with 13-inch touchscreens as well as one USB power port and a power outlet, while Moana Economy is equipped with a 12-inch touchscreen at each seat as well as a USB power port. Seat cushions are custom-designed on the Dreamliner in the Tahitian handcrafted "tifaifai" style – meaning to mend or to patch – a style common in the interiors of French Polynesian buildings. In Moana Economy, the colorful cushions are made to look like scattered exotic flowers, while Poerava Business Class reflects green palms offering a fresh and breezy feeling. The interior and amenities of the 787 Dreamliner are designed to be reminiscent of Polynesian crafts, arts and natural materials. 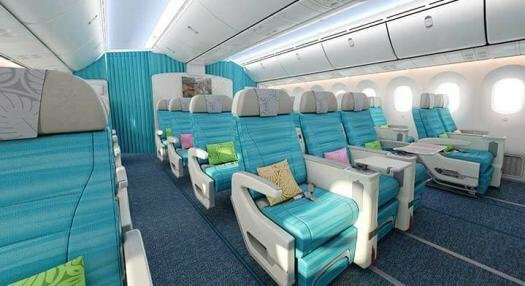 Throughout the cabin, Air Tahiti Nui aims to ease their passengers into the relaxing and natural surroundings they will find while visiting Tahiti, which they accomplish with the cabin designs, seat designs and their level of service. The airline knows there is no better way to introduce first-timers to the Tahitian life than by first-hand experience.